You've probably heard of a muskie, a mackerel, and a monkfish, but what about a mustache Zamora, or do you know the scientific names for any of these? Knowing both the common and scientific names for fish helps when researching and talking about specific species. It never hurts when you're trying to sound like an expert. Here are some of the many fish names that start with M.
Bedotia geayi. A freshwater fish found in the Mananjary River basin in Madagascar. A small fish, up to 9 cm in length, it favors the quiet, shaded waters of small streams. Dimidiochromis compressiceps. A native of Lake Malawi, Africa, this aggressive breed is known to bite the eyes out of prey (thus the nickname). It also devours its prey starting with the tail, perhaps the only predator that does this. Lutjanus argentimaculatus. A subtropical reef-dwelling fish found in waters from East Africa to Samoa and Australia. They are a prized food fish in the Indo-Pacific region but are difficult to catch in large numbers because they tend not to group. Neolamprologus multifasciatus. Native to Lake Tanganyika, this territorial breed lays its eggs in empty snail shells, which it buries until only the opening is exposed. Carnegiella strigata strigata. A small (up to 3.5 cm) species found in rivers of South America. They like blackwater--dark, acidic water full of decaying organic matter. They must be kept in tanks with lids because they can jump when startled. Julidochromis transcriptus. 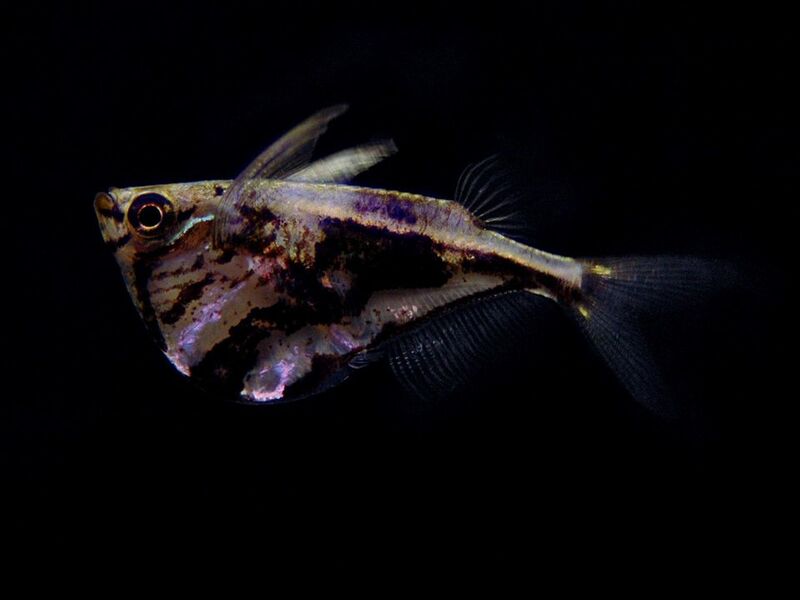 At 7 cm in length, this is the smallest breed of "Julie" fish. Found near the shores of Lake Taganyika, Africa. Common coloring includes black and white striping and a bright blue line along its several fins. Periophthalmus novemraditus. Also called Indian Mudskipper, a brackish-water amphibian native to India, Southeast Asia, and the Philippines. Must be kept in aquariums with lids because they can use their pelvic fins to climb the tank walls. Marakeli Cichlid - Paratilapia polleni "Madagascar"
Moonfish "Red Wag" - Xiphophorus maculatus "Red Wag"
Moonfish "Vtiatus Sunset" - Xiphophorus maculatus "Vtiatus Sunset"